Area : 130,058 sq. kms. Population : Approx.61.5 million people per sq. km. Languages : Tamil,Telugu and Kannada. Life in Tamilnadu is leisurely and gracious. Tamilnadu is a wonderful tourist place. It has glorious culture and a rich tapestry of history. It has natural beauty i.e. blue beaches and clear skies. People enjoy the peace amidst the lively and magnificent temples. Tamilnadu is referred as "Land of Temples". It's really a beautiful experience for holidaying in Tamilnadu. Tamilnadu is the home of Dravidian art and culture, characterised best by the amazingly ornate temples with their soaring towers known as gopurams. Tamilnadu celebrates all their festivals in colourful splendour. Tamilnadu offers the traveller excellent value, particularly in accommodation. Hotel prices are generally lower than they are further north and standards are often higher. The food in Tamilnadu is comparatively inexpensive and good. Tamilnadu provides the visitor with a wide variety of cuisines. Tamilnadu has a tropical climate. It is generally warm. April and May are the hottest months with the mercury often soaring above the 40 ºC mark. Coastal regions also get uncomfortably warm and humid during these months but the nights are usually cool, due to the sea breeze that sets in during the afternoons. Summer temperatures are quite equable at the foothills of the ghats. But the most pleasant are the hills stations where the maximum temperature rarely rises above the mid twenties in summer. 'Winter' falls between November-February when the climate is pleasantly cool unless you wish to visit the hill stations, in which case you will need woolens. Minimum temperatures in the plains rarely dip below 20 ºC while in the hills the mercury may drop to 5 ºC or below. The most important point to remember about Tamilnadu is the rainy season between October and December when the north-east monsoon brings rain in spurts. Throughout the year for the plains, cotton is the best wear. In the hilly areas, you will need to carry a light sweater or two, heavier woolens are a must for winter. Umbrellas are extremely needed during the hottest months and raincoats will come in handy between October and December i.e. the rainy season. The best time to visit to Tamilnadu is between November and March. Tamilnadu with an estimated area of 1,30,058 sq.km. ranks eleventh amount the states of India in size. Geographically, Tamilnadu is situated on the eastern side of the Indian Peninsula between the northern latitude of 8.5" and 13.35" and the eastern longitude of 76.15" and 80.20". 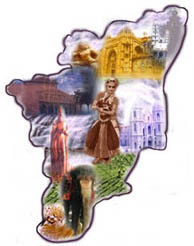 Tamilnadu is bounded by Karnataka and Andhra Pradesh in the north and Kerala in the west. The eastern and western tips of the state are defined by the Point Calimere and Mudumalai wildlife sanctuaries while the northern extreme is Pulicat lake and the southernmost tip is Kanyakumari, the land's end. The people of Tamilnadu lead relaxed lifestyles. The urban social recreations include clubs, golf links, beach resorts, theme parks, racecourses, art and theatre. Visits to game reserves, holiday resorts, long sandy beaches, zoological and entertainment parks and sanctuaries are the other many social pastimes available. Tourists spots include hill stations like Ooty and Kodaikanal which are all time favourites.